An admission: I cannot pronounce the word posthumous. Seriously, try as I might, it's all just one big lisp for me - and as a librarian it's a bad time to not be able topronounce this word because there are a number of books by great, late authors that have recently been or are being posthumously released this fall. 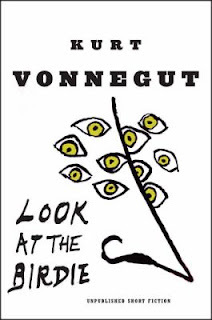 Take the new book from Kurt Vonnegut, who died in 2007. Look at the Birdie is a collection of short stories that were previously unpublished. Released on October 20, this is actually the 2nd collection of new writings to be released since Vonnegut's death. Armageddon in Retrospect - a collection of essays about war and peace - was released in 2008. Also being posthumously released before year's end is Pirate Latitudes by the late Michael Crichton. Crichton died last year after a battle with throat cancer, much to the shock of his fans, as his illness had not previously been made public. Pirate Latitudes is an historical adventure novel set in the Caribbean in the 1600s, and it has already been optioned for film by Steven Spielberg, who may also direct the movie. The book is the first of two Crichton titles slated for posthumous release, a second, as yet untitled book, is due for release in 2010. Books from recently deceased authors are often a comfort for their fans, especially when an author died young and unexpectedly. This has certainly been the case for fans of American author E. Lynn Harris, who died of a heart attack in July just weeks before the release of his novel Mama Dearest. While there are also late authors from whom a new book is not only not unusual, but actually expected - like V.C. Andrews who died in 1986, but has published more books since her death than she did while living (yes, it's a ghost writer) - there are other authors where a rediscovered or previously unpublished book is a major event. This fall will see the release of a previously unpublished book by Russian great Vladimir Nabokov. Entitled The Original of Laura, Nabokov apparently asked that this novel never be published, but published it will be - on November 17th of this year.